Microsoft has announced that it has concluded a licensing agreement with Taiwan-based Compal, one of the world’s largest Original Design Manufacturers, which makes Android-based devices like tablets, mobile phones, e-readers,etc. Microsoft has been making similar progress too with the Original Equipment Manufacturers, who produce Android devices under their own brands. 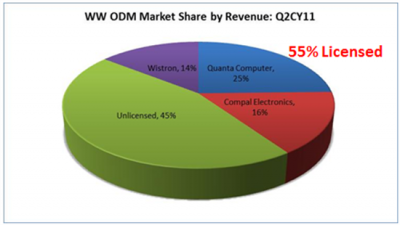 Following the agreement earlier this month with Samsung, Microsoft now has license agreements in place with OEMs that account for 53 percent of all Android smartphones in the United States. Microsoft and Apple, both have been accusing Android smart phone makers, of having stolen their products. 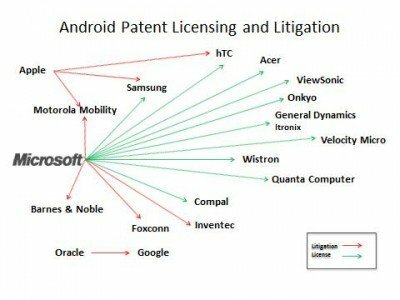 This diagram by Microsoft shows how the Microsoft and Apple have been pursuing their legal claims against Android. Since Microsoft launched its IP licensing program in December 2003, it has signed such licensing agreements with over 700 companies. Anand Khanse is the Admin of TheWindowsClub.com and a 10-year Microsoft MVP Awardee in Windows for the period 2006-16. He enjoys following and reporting Microsoft news and developments in the world of Personal Computing & Social Media.